The looting of the Iraqi National Museum in Baghdad has prompted criticism of U.S. forces for not doing more to stop the ransacking. CNN's Jim Clancy reports. Should soldiers be expected to protect cultural treasures in times of war? BAGHDAD, Iraq (CNN) -- The looting of priceless artifacts, many thousands of years old, from Iraq's National Museum and other cultural institutions has drawn sharp criticism from local and international academics and officials, as well as a U.S. acknowledgment of a "void of security." 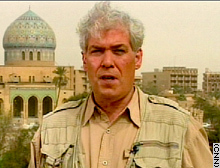 Curators from the National Museum led CNN correspondent Jim Clancy and other reporters around the plundered building in Baghdad. He discussed his observations and conversations with officials and others. CLANCY: We talked to some people, the directors of the museum here in Baghdad. It's the Iraqi National Museum -- 500,000 years of history, the most complete timeline of civilization that existed in any museum in the world. It is shattered, it is smashed. The curators of the museum led reporters through it today on a bit of a media tour. They showed us the places that had been broken down when thousands of looters went in. They now believe, because of some of the evidence that they have found, that some of the items were taken [by art and cultural] professionals. Among other things they found were glass cutters that they said are not sold in Iraq. They are looking into that. They have closed off the main area of the museum. What we saw this day was the administrative part of the museum, where some uncataloged or ready-to-be-processed artifacts were kept. We saw many things that had been smashed, doors hacked in. We saw that entire archives of the history of archaeology in this country over the past century had been taken away. Other than a professional job, there have been rumors that U.S. Marines were involved in this, opening the doors to the museum. I talked to the one man today who was actually there when the looters plundered the building. He said the Marines were absolutely not involved in any way. The Marines did come briefly, firing over the heads of the looters, he said. The looters left, but came back when the Marines departed and cleaned up the job, devastating the museum. The extent of damage still not known, but there is a lot of anger, because as Dr. Donny George, the director of antiquities said, there were promises it was going to be otherwise. DONNY GEORGE: Three days ago, me and [the] chairman of the State Board of Antiquities went to the headquarters of the Marines in the Palestine Hotel. We waited there for about four hours until we met a colonel . And that day, he promised that he will send armored cars to protect what's left of the museum. That was three days ago. But until now, nobody came. I don't know what kind of protection [the museum would receive]. Even in the news last night we heard that [Secretary of State Colin] Powell said that we will protect the museum. And I was expecting this morning to come and see some of the armored cars here. But nobody is here. CLANCY: One of the things that was taken was a bronze bust dating back about 7,000 years. It weighed hundreds of kilograms and was taken off the second floor. The curators say no normal looters did that.